Our research is in the general area of dynamics, guidance, navigation and control (DGNC) of aerospace vehicles. Our is focus on developing practically implementable DGNC methods for aerospace systems, supported by rigorous mathematical foundations. In particular, we are interested in developing DGNC methods which enable new types of aerospace systems/missions. The International Space Exploration Coordination Group (ISECG) is a forum set up by 14 space agencies, to advance the global space exploration strategy. The ISECG has recently released a Global Exploration Roadmap (GER), providing a vision for the long-term goals of international space exploration. These include a Deep Space Habitat (DSH) near the Moon, and lunar and asteroid missions. A number of technological developments are needed to make these missions possible. It is within this context that we pursue a number of the research topics indicated below. A DSH will act as a base station for missions to the Moon or near-Earth asteroids. A halo orbit around the second Earth-Moon Lagrange Point (EML2) is emerging as the favored choice among international space exploration partners for a DSH. Relevant research directions that we are interested in include: Design and Station-Keeping of Orbits about EML2; Guidance, Navigation and Control for Transfers to and from a DSH; Autonomous On-Orbit Self-Assembly of Large Space Structures, such as will be required for the eventual construction of a DSH. The GER identifies precise deep space navigation and precise on-board timing as necessary for multiple spacecraft coordination in deep space. For Earth-bound spacecraft, this is readily provided by Global Navigation Satellite Systems (GNSS), including the U.S.-owned Global Positioning System (GPS), the Russian-owned GLONASS system, and soon the European-run Galileo system and the Chinese-owned BeiDou system. In deep-space environments such as near the Moon, these systems are not available, and existing deep-space navigation technologies are not precise enough. We are interested in the design and use of a GNSS-like constellation about the Earth-Moon L1 point for GNSS-like precise navigation and timing in the lunar vicinity. Asteroids provide key insights into the formation of planets, as well as the solar system itself. Exploration of asteroids is also important for protecting Earth from potential asteroid impacts. There are several research efforts on developing methods to deflect asteroids from collision with Earth. To be successful, the physical properties of asteroids need to be well understood – requiring their exploration. Relevant research directions that we are pursuing include: Guidance and Control for Transportation of a Boulder from Asteroid to Lunar Orbit (this is relevant to the recently announced Asteroid Retrieval Mission); Coupled Attitude/Orbital Dynamics and Control in Close Proximity of an Asteroid; Gravitational Model Determination for Asteroids Utilizing Orbital and Attitude Measurements. There are a number of practical limitations that must be accounted for in a real control system design and implementation. These include control magnitude and rate saturation, system delays, measurement and control quantization, system uncertainties and measurement errors. In addition, when an actuator fails (such as failure of a reaction wheel on a spacecraft), the spacecraft may become underactuated (the number of control inputs is less than the number of degrees of freedom), in which case the control system design and analysis becomes significantly more complicated. We are actively performing research on the control of aerospace systems in the presence all of these practical limitations, and in particular the underactuated case. The ability to determine the positions, velocities and attitudes of vehicles is essential to being able to control them. Typically, some sort of sensor-suite is used (e.g. accelerometers, gyros, magnetometers, GPS, etc. ), and the information from these sensors must then be fused to obtain the best possible vehicle state estimates. The general trend in sensor fusion methods is one of increasing complexity, and often stability cannot be guaranteed analytically. As such, the stability and robustness of these techniques can be very sensitive to proper tuning, and their computational complexities can be a barrier for use on very small platforms where computational power is limited, such as is the case on very small satellites. We have developed computationally simple schemes, for both the attitude and translational navigation problems with proven robust stability, and performance guaranteed to be similar to that of the optimal Kalman filter for such systems. The state descriptions for many aerospace systems naturally include constraints on a subset of the states. For example, a vehicle’s attitude can be described by a rotation matrix, which has orthogonality and positive determinant constraints. Alternatively, a vehicle’s attitude may be represented by a unit quaternion, which has a unit norm constraint. This leads to complications in the state estimation of such systems. We have developed an approach to Kalman filtering for systems with states subject to arbitrary constraint sets, in both the continuous and discrete-time settings. In particular, unlike the existing literature, our approach can handle inequality as well as equality constraints. We have successfully applied our approach to attitude determination of a passively magnetically stabilized spacecraft, where the attitude is represented by a unit quaternion which is subject to a unit norm constraint, and states corresponding to magnetic hysteresis rods are constrained to lie within hysteresis loops. Attitude control of Earth-orbiting spacecraft using magnetic actuation is a highly reliable attitude control methodology, whereby magnetic torquers create a magnetic dipole that interacts with the Earth’s magnetic field to create a torque on the spacecraft. The reliability is because magnetic torquers have no moving parts (actuators with moving parts degrade over time), and the power supply (solar power) is essentially infinite (unlike thrusters, for example, which require a limited on-board propellant source). However, the analysis of a magnetic attitude control system is difficult, due to the variability in the Earth’s magnetic field throughout an orbit, as well as the instantaneous underactuation that results from magnetic torquers (it is impossible to generate a magnetic torque parallel to the Earth’s magnetic field). As such, many practical magnetic attitude control systems are designed based upon heuristic methods, rather than rigorous analytical methods. We have developed fault-tolerant magnetic attitude control schemes for spacecraft spin-stabilization and dual-spin stabilization with rigorously proven stability and convergence under the failure of up to two magnetic torquers (typically three magnetic torquers are required – one per axis), in the presence of torquer saturation and control quantization. The significance of the developed magnetic attitude control schemes are that they are highly robust, and the rigorous analysis provides great confidence in their practical application. We have developed a sequential Lyapunov analysis technique for the analysis of attitude control systems. This technique allows one to obtain successively tighter ultimate bounds on the steady-state tracking error. This is very useful in practice, since typical ultimate bounds are quite conservative, and by using this method, conservatism can be reduced. This technique has been successfully applied to both non-adaptive and adaptive spacecraft attitude tracking controls in the presence of system uncertainty, disturbance torques and measurement noise. The resulting analytical bounds on the steady-state tracking error are non-conservative, and can be used to assist attitude control designers with control gain selection to meet design requirements, if bounds on measurement noise, system uncertainty and disturbances are given. 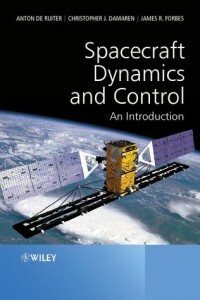 We have also extended this technique to the case of observer-based attitude control, obtaining a separation principle. This allows the attitude control designer to separately design the control law and the observer, while still meeting design requirements. This technique is currently being extended to more general nonlinear systems. It is envisioned that the sequential Lyapunov analysis technique can also be applied to systems with bounded but otherwise unknown time-delay, which is a very important practical issue and is a subject of future research. Many aerospace systems are made up of interacting subsystems to achieve a given purpose. For example, to achieve flight control, an aircraft typically has airframe and engine control subsystems. Imposed on these systems are a number of specifications that must be met simultaneously. It is useful if each subsystem is controlled locally, with maybe some higher level supervisory control system coordinating the subsystems. This is beneficial from the point of view of robustness of the integrated system, as well as the fact that subsystems often have different manufacturers, allowing them to test their subsystems independently. We have developed a method for partially automating both the continuous and discrete-time control system design processes such that the overall specifications are met, regardless of the choice of controller structure. Robustness can be incorporated by considering multiple distinct plant models to be stabilized simultaneously, H∞-constraints, and constraints on the closed-loop pole locations. This method has been successfully applied in simulation to an aircraft integrated flight/propulsion control example, and in hardware on a three degree of freedom laboratory helicopter test-bed. This work has focussed on linear time-invariant systems. Future work will look at extending these methods to linear time-varying and nonlinear systems. We are currently developing methods for UAVs to be able to autonomously avoid obstacles, while still staying as close as possible to a pre-programmed flight path. This is very relevant for UAV applications where a UAV is required to fly at very low altitudes over poorly known terrain for the purposes of generating high resolution geophysical surveys of the region. At these low altitudes, potential obstacles could include unmodeled terrain, trees and power lines. It is vital that the UAV be able to detect and avoid these autonomously in real-time. In addition, so as to minimize any holes in the geophysical survey, the UAV needs to stay as close as possible to the pre-programmed flight path.